If you don't know where you make your mistakes, that's your worst mistake: not knowing where your mistakes are at. Earlier this week, I posted on my LinkedIn page about something called “The Dunning-Kruger Effect”. (Link to my LinkedIn Page). 1. People who are incompetent at something are unable to recognize their own incompetence. And not only do they fail to recognize their incompetence, they’re also likely to feel confident that they actually are competent. They will also perceive themselves as superior to others. 2. Conversely, highly competent individuals may erroneously assume that tasks easy for them to perform are also easy for other people to perform, or that other people will have a similar understanding of subjects that they themselves are well-versed in. 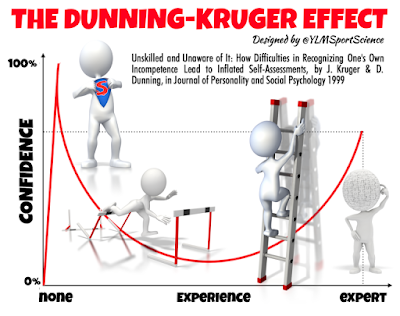 Many parents of teenagers will suggest that their teenager is a prime example of the first component of the Dunning–Kruger effect. Their teenager believes that they are always right. The teenager cannot understand why people don’t see things their way. The teenager perceives their teachers and parents as people who are “lesser”, and therefore the teenager will choose to ignore the advice given by teachers and parents. Another prime example of the first component of the Dunning–Kruger effect are the sports fans who call into sports talk radio. It is amazing how a fan who sees a prospect play 2 games thinks he knows more than the team's dozens of scouts, who each watch hours and hours of film on each prospect. But that is exactly what the Dunning–Kruger effect suggests, this fan sees 2 games, gains a little bit of knowledge, and now thinks he is an expert, all while ignoring and dismissing the views of those who have more knowledge and experience than he does. The answer is quite simple. A person needs to have a healthy amount of doubt. Use this doubt to get you to learn more. Use this doubt to open your ears to enable you to hear constructive criticism from others. If a person is certain that their work is the best, it leaves little room in their mind for improvement, however, if a person feels that they can improve, they will take constructive criticism much differently. The 2nd component is also interesting, the theory that many experts believe that others possess the knowledge that they have. This can be viewed two ways. This can be viewed that experts don’t really believe that they possess any special knowledge, thereby diminishing their stature as an expert. Additionally, it can be seen that the expert expects others to know the things that they do. The latter view can cause issues. Here is an example that I have seen with my own eye. A Rebbe will get up and give a shiur using certain yeshivishe and yiddish words assuming that the students understand what he is saying. Often there are at least a few students who don’t know what these terms mean. They then choose to remain quiet, deciding that it is better to not understand rather than reveal their lack of knowledge. There are many more examples of this. The manager with his new employee, the new teacher with her students, doctors with patients, but there is one specific relationship that I would like to discuss within the confines of this example, and that is the husband-wife relationship. There is a lot of knowledge that the husband has that the wife doesn’t. Likewise there is a lot of knowledge that the wife possesses that the husband doesn’t have. At some point in the marriage, the wife might learn that her husband doesn’t know how to sew a button, and the husband might learn that his wife doesn’t know what to do when the circuit breaker keeps switching off. These revelations might be a shock to the one with the knowledge. Sometimes these revelations will lead to questions like “You really don’t know how to do something as simple as sew a button?” which can then lead to harsh feelings between the couple. In reality the one who has the knowledge can’t allow this to turn into a shalom bayis issue. The Dunning–Kruger effect states that the issue is NOT that the wife doesn’t know what to do if the circuit breaker keeps switching off. The issue is that her husband expects her to know. The husband needs to calm himself by reminding himself that he is the expert, and the expert often mistakenly believes that others possess the knowledge of the expert, when they don’t. Once the husband is able to realize where the problem lies, he has no reason to ridicule and insult his wife for her lack of knowledge. Yisroel Picker is a Social Worker who lives in Jerusalem. He has a private practice which specializes in working with people of all ages who are looking to improve their awareness and their social skills. He also lectures on the topics of communication and child safety. I like the way you applied this theory to intimate partner communication. That does happen a lot and it's good how this article can make people aware of it.